Twistfix, one of the leading suppliers of damp proofing and wall ties to the UK and Irish markets, are one of Brickweb's biggest success stories. The Twistfix customer base is extensive and diverse, ranging from DIY enthusiasts to major building contractors; many famous buildings have benefited from the use of Twistfix products including York Minster Cathedral. These customers demand a high level of functionality from the websites they order from, a need that is easily met by Brickweb with our powerful combination of state-of-the-art technology and the unrivalled web expertise of our efficient and capable team. We continually highlight the importance of e-commerce and m-commerce to our clients as mobile and tablet shopping continues to grow at an exponential rate. 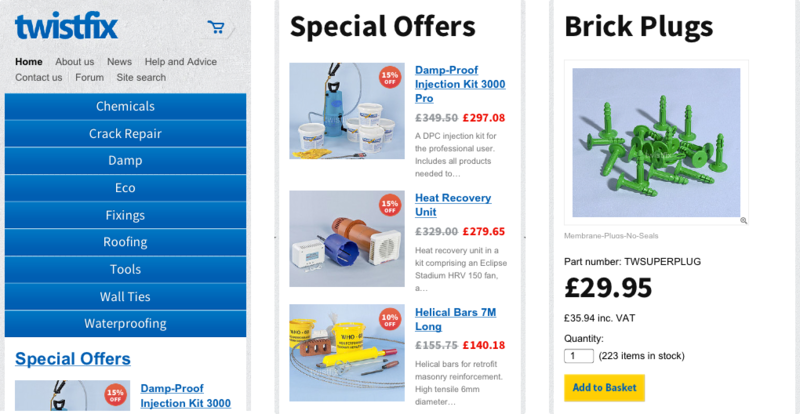 Twistfix were quick to take advantage of Brickweb's expertise by deciding to upgrade to a dedicated mobile website that optimises its display automatically according to the device from which it is accessed. This had an instant effect on Twistfix customers who embraced the new mobile website, using it extensively to browse, place orders, find professional information and use the popular registered contractor scheme. Mobile shoppers also demand a simple and secure online checkout, a service provided by Brickweb as standard. As well as offering superb functi­onality, the Twistfix website benefits from a sleek, contemporary design. Customers find the navigation to be intuitive and the brand's image is seamlessly maintained throughout the shopping experience online. Great attention is given to every detail of Brickweb's superlative websites in order to make them truly stand out from the crowd. Behind the scenes is the unique, custom-built and bespoke Brickweb Content Management System (CMS). This allows Twistfix to quickly and easily manage all aspects of their business, including stock management, pricing and promotions. Visitor numbers and activity can be displayed in a variety of ways, offering deep insights into customer behaviour. This information can then be used to optimise the business strategy, a process that takes place regularly with full involvement from both parties. Please visit the Twistfix website or use your mobile to experience the superb quality of Brickweb design. For more information on how Brickweb can revolutionise your online business and make you our next big success story, please contact our team on +44 (0)1254 277190 or email info@brickweb.co.uk.